(Newser) – Clint Eastwood's Sully was called "electrifying," and the next movie on his directing roster is promising to be another heart-stopper—and headline-grabbing, thanks to an unusual move he made in casting it. The upcoming film is called The 15:17 to Paris, which documents the 2015 terrorist train attack in Paris and the three Americans who thwarted it, and the AP reports that Eastwood has cast the three actual friends from California—two of them servicemen—in the starring roles. 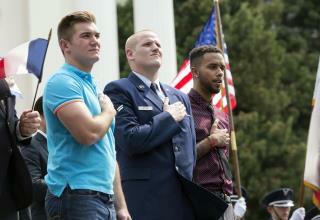 A Warner Bros. statement notes that Anthony Sadler, Oregon National Guardsman Alek Skarlatos, and US Air Force Airman First Class Spencer Stone will play the "heroic trio" in the movie about their lives and how their "brave act turned them into heroes during a [high-speed] railway ride." How do you make a 90 min movie out of a 5 min occurrence? My initial reaction is that I want Clint to REALLY sort out the fact from the fake. Idk if this was false flag but it is on Eastwood to work out the foundation prior to moving forward.